3 Bedrooms, 2 Baths House, Sleeps 6, large pool & dock, close to beach & shops. come on down and enjoy paradise! Elayne & I are high school sweethearts and have been married for 50+ years. We live in northern NJ where we raised our 3 sons who have given us with 5 fabulous grandchildren. Vacationing in Florida since we were small children we have always loved the area. Elaine's first trip to Sanibel Island was when she was 4 years old. Our boys have always thought of Florida as their favorite get away spot and have brought their children who now love it too. 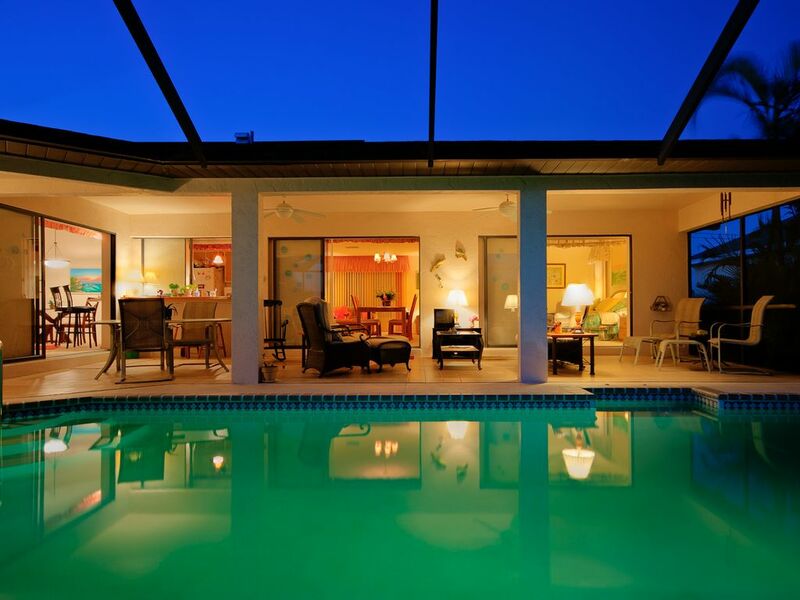 It has always been our dream to have a vacation home in southwest Florida. We looked for the perfect dream house for a long time and now our dream has come true. We found our home in paradise. You may find bigger or less expensive houses in Cape Coral, but you will not find a home with a better location, better supplied, cleaner or full of more good times. Our home is all set for OUR family to enjoy. It is not your average rental, it is our home and we have supplied it for our family to have a GREAT time. Our home is in a quiet area but close to everything that will give you your best vacation ever. Very quiet neighborhood but close to everything you might need or want. Location, location, location! Master suite has nice large walk in shower. Guest bath has shower in tub. Lovely wide saltwater canal front home with nice waterfront patio and dock. We supply kitchen, towels, hand towels, bather towels, pool towels & beach towels. Electric coffee maker and electric tea pot. Toaster oven plus a 2 slice pop up toaster. We supply paper towels and cleaning supplies for you to get started. We supply pretty dishes, pots and pans & all you will need to prepare a gourmet dinner for 8. Formal dining room plus breakfast table and breakfast bar. We also have a poolside dining table and a waterfront dining table at our dock. HD Samsung Smart TV 47 Inch in family room plus TVs in all Bedrooms and on the Lanai. Kayak and Canoe rentals available at local marinas and parks. Boat rentals available from local marinas. We supply fishing poles and gear. Enjoy our beach chairs, cooler, umbrella and beach toys. We also supply pool toys & floats. Tennis courts are available at Cape Coral Yacht Club and local parks. Many nearby public Golf Courses and we even have nearby mini golf. Large heated pool with walk in steps and railing. Our pool is heated with a heat pump and has a cover to keep it warm on cool evenings. Cape Coral also has a community pool at the Yacht Club with fun activities and exercise and you can enjoy the Cape Coral's Sun Splash Community Water Park. We were here for 3 weeks and were pleasantly surprised. everything was there, nice pool and we had a pleasant stay. I have to say it is better than it looks on the pictures. I really cannot say enough good things in the space allotted. Our family consists of my husband and I, our 9 year old daughter and 21 year old son. The house is large - we did not even use the formal living or dining room. The photos are very accurate. The house was clean and the description was spot on. 1) The kitchen window is a sliding window. You can cook then transfer your food out of this window onto the bar outside. 2) The kitchen is TRULY stocked. There were PLENTY of plates, glasses and cookware. There were even grilling tools for the gas grill. 3) There is a TV (with cable) outside by the pool. The kids loved watching TV from the pool, but also it was entertainment for my husband and I when our 9 year old wanted to swim and no other adults did. The furniture was comfy and there were enough chairs and stools to accommodate numerous people. 4) The closets were large. They also had plenty of hangers for our week. 5) There were PLENTY of linens - including beach towels. 6) There were beach umbrellas and chairs, fishing poles and 3 bikes stored in the garage. We did not make use of everything, but how nice to know they were available! 7) This pool (unlike our previous rental homes) remained clean and pool service was mid week! Perfect in case it stormed. You will never lose the whole week's pool time! 8) Being on the canal was much more beautiful than we imagined. At night, you can hear the fish jump out of the water. Wear mosquito repellant! There is a table and 4 chairs on the patio by the dock. 9) The neighborhood is quiet, but friendly. The neighbors at the end of the road insisted my husband try their hammock! Very sweet people! The town of Cape Coral was not very large and easy to navigate. Del Prado Blvd, minutes away, had many food choices and grocery stores. One warning, Cape Coral grocery shopping was higher than what we expected. After some research, it appears Cape Coral's cost of living is higher than the Florida average. Be prepared to pay a little more. It is an easy, pleasant drive to Ft. Meyers and Sanibel Island. It took us about 30 mins to get to either. Two restaurant suggestions - Stay away from Asia Buffet on Del Prado, but absolutely go to Azucar Restaurant & Bakery on the same road. GREAT food and Cuban coffee! Don't hesitate to make this your home for the week/month. It is worth it! Thank you Bob and Elayne! Thank you for the nice review. We are so happy you enjoyed your stay at our home. We do have a lot of extras at our home, because it is our home. We have it supplied for ourselves, our family, friends and visits from our grandchildren and we are happy to share all those little extras with our guests. As for the grocery prices I have to agree that Publix Supermarket (we like the newer one on Veterans Pkwy) is a little more expensive but the quality is high and their take-out is great. Cape Coral also has several Walmart Stores and we have found them to be about the same price as Ft. Myers and much lower priced than any of the supermarkets on Sanibel Island. We have been coming to Lee County since we were children and we looked a long time before we picked this house. To us it seems like it is in a lovely neighborhood and the perfect location. Our home is close to both Cape Coral beaches, restaurants, Cape Coral’s great parks, where there is always something going on and just 20 to 30 minutes to world famous Sanibel Island, Ft. Myers Beach and about the same driving time to Ft. Myers International Airport. Thanks for the tip on Azucar Restaurant & Bakery; we will give it a try on our next visit to FL. We just love Cape Coral and we are so glad you liked it too. Hope you will come again. racquetball courts. We have local car, bike, kayak, & boat rentals. colleges and universities also offering entertainment and theater. have it all here in paradise!